Successfully Added Vacuum Smartphone Holder - Fit For All Phones, 360-Degree Rotation, Plug And Play (Gold) to your Shopping Cart. With this vacuum smartphone holder for in your car, you will be able to safely and efficiently attach your smartphone to any smooth surface such as your dashboard or windshield. With this magnificent car gadget, your smartphone will always be within reach. Crafted out of a durable ABS material and equipped with a powerful silicone vacuum suction surface, this phone holder can be used to attach your smartphone to nearly any part of your car’s interior. 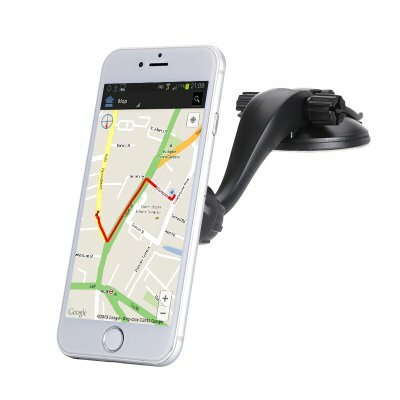 Being able to keep your cell phone at one place and within reach whilst driving, this phone holder offers a convenient platform that to which you can attach your cell phone while using it for hands-free calls or GPS purposes. Equipped with a powerful and high-quality silicone suction surface, this car phone accessory does not make use of any glue based materials or magnets that may be harmful to your electronic device. Additionally, this innovative phone holder features a 360-degree rotating design – allowing you to adjust the viewing angle by simply rotating your smartphone while it is attached to the holder. Its powerful suction design makes this smartphone holder fit to be used with any cell phone out there. No matter whether you’re using a compact 4-Inch device or a large 6-Inch phablet-like smartphone – this phone holder is guaranteed to hold your device and bring along great in-car convenience. With its simple and easy to use design, this vacuum smartphone holder can be attached to any smooth surface by simply pressing its suction cap against it. Crafted out of high-end material, the silicone suction cap of this smartphone holder provides a stable and powerful fit – assuring that your phone is in safe hands and won’t simply drop by a slight bump in the road. When attached to your window or car dashboard, this phone holder conveniently allows you to keep your smartphones at place and within sight at all times. Not only does this bring along great efficiency for when using your smartphone for hands-free calls or navigation purposes, it also allows your passengers to watch media on the go without them constantly needing to hold their device. This phone holder comes with a 12 months warranty, brought to you by the leader in electronic devices as well as wholesale electronic gadgets..